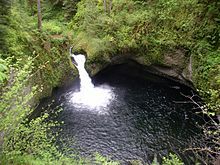 Punch Bowl Falls on May 11, 2005. Punch Bowl Falls is a waterfall on Eagle Creek in the Columbia River Gorge National Scenic Area, Oregon, United States. Eagle Creek drains into the Columbia River, with its outlet on the Columbia River Gorge in Multnomah County. The falls is 35 feet (11 m) tall and 10 feet (3.0 m) wide. Eagle Creek cuts through a narrow channel and shoots powerfully into a large bowl that resembles a punchbowl. This waterfall was responsible for the waterfall classification type of punchbowl. These falls are not to be confused with another set of falls with the same name, found in Jasper National Park, Alberta, Canada near Miette Hot Springs. 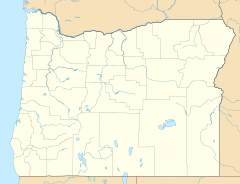 This Hood River County, Oregon state location article is a stub. You can help Wikipedia by expanding it. This page was last edited on 30 March 2018, at 10:16 (UTC).